The twins, who are based at the Royal Derby Hospital, learned of the chance to train as clinical healthcare support workers at a jobs fair run by Derby College last summer. Both had recently completed BTECs in Health and Social Care at the College and went along to the event at the Johnson Building to see what training opportunities were available with the Trust. Jessica is looking after orthopaedic in-patients, while Lucy is based on a short stay medical ward. Both girls enjoy all aspects of their role and have become dab hands at making beds, although they agree that talking to and making patients comfortable is the part they like best. 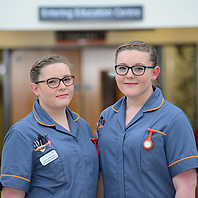 The sisters would like to be nurses or paramedics, but for the time being are happy to remain as Clinical Healthcare Apprentices on their current wards.